IS MASS MEDIA AND THE INTERNET HELPING OR HURTING YOU? Since the internet, and particularly smartphones, became household commodities, mass media’s impact on people and societies has increased exponentially. As you might expect, there is a swinging pendulum of public opinion which often shifts from decrying the ills of this trend to extolling the many virtues of on demand technology. How is media affecting me? How is mass media impacting the next generation? How do video games change us? How does on-demand media impact health? Is mass media truly important? How do we use mass media and social media well? Is mass media a good thing? Answering these questions can help you to be smart about how you interact with the constant barrage of media being directed at you and your family. So let’s think through the implications of mass media together so that we can come to informed conclusions. HOW DOES MASS MEDIA AFFECT YOU? Many are wondering mass media, and social media, in particular, is a good thing or bad thing. Of course, for every type of media, there are a host mixed opinions, some based on research, some not. Neil Postman was asking these same types of questions over the mass adoption of the television. A positive use of technology and mass media enables people to become informed, collaborate in innovative ways, or stay in touch with friends and family. Yet, these same connections can be used for dangerous cybercrime. Social media can help people to feel connected and happy, to connect with old friends and make new ones. However, that same social media can lead to depression or anxiety, when life doesn’t meet the expectations created by perfectly edited profiles. The internet may be a source of motivational messages, videos, or blog posts that improve your life and increase productivity or healthy living. However, it’s just as possible that these very messages can prevent you from getting out there and living. These are just a few examples of the vastly different ways media can impact our daily lives. Because mass media affects each person differently, you need to look at your own life to make informed decisions. Where do you fall on the pendulum? How does your use of social media affect your mood, productivity, and sense of well being? If you tend more toward the negative impacts – depression, anxiety, inactivity – it may be time to limit your media consumption. WHAT IS THE IMPACT OF MASS MEDIA ON CHILDREN? potential to help and to harm, as is true with most media types. Many negative effects have been recorded, and kids often spend more time watching television than on any other activity. However, if the television time includes educational programming and parent supervision, the power can be harnessed to help with learning and have positive effects. With this in mind, parents must think critically about how their children are consuming television. Are they largely involved in what and how often their children are watching, or is it more of a hands-off experience? This is perhaps even more important to think through now that most “television” consumption consists of Netflix, Hulu, and other streaming platforms. Making the decision to be diligent about these decisions now will improve children’s interactions with television, and prepare them to interact well with other types of media as they mature. WHAT IS THE IMPACT OF MEDIA ON TEENS? Media often is described as harmful to teens, and while this is certainly true in some circumstances, it can be best understood as having mixed effects. The key is to be aware of how mass media and social networking affect the brain so that you can make intentional decisions about how to use it. Motor skills are improved by typing, clicking, playing games, and other tech-related finger skills. Access to mass news media can improve reading skills. Social network activity is theorized to improve writing and socializing skills. Additionally, the content of media stories or social media posts can be useful and meaningful to teens. With platforms like YouTube and Instagram, they have access to people’s stories they might never have heard otherwise. In this way, teens may learn that many others are experiencing similar struggles to their own, giving courage and confidence. However, there are significant negative effects as well. Knowing about these potential risks of social and mass media consumption is important for both teens and their parents. In this respect, knowledge really is power, as it will enable both parties to be strategic about the role of media in their lives. Read more about media communication master’s in communication options. and gaming becomes more and more realistic. Research shows some mixed effects from video game use. Though the problem solving and dexterity skills employed can lead to higher intelligence or better motor skills, the violent or other disturbing content in games is of high risk to well being. It’s established that seeing violence can desensitize one to its effects. As with other types of media mentioned, it’s critical that parents exercise caution about what types of games their children play and how often they do so. DOES MASS MEDIA DAMAGE HEALTH? health. There are numerous physical problems which may arise from this consumption, particularly if left unchecked. The effects of smartphones often first show up as eye strain and neck pain, the inevitable result of constant screen-time and often slumped positions while using these devices. Obesity is a risk if much time is spent in sedentary activity. Some research shows links between mass media consumption and anxiety and depression. There can be a change in happiness, social skills, and peace of mind that is attributed to media and the internet. It is most important to monitor your happiness and health and correlate them with your own practices so you can make informed decisions for your or your family’s well being. There are many recommendations for being wise with media consumption. Parents must be familiar with current sites and channels, and the types of content that their children come into contact with. Ask questions and browse with your child. Set clear and appropriate ground rules for young ages, which then build a strong foundation for future responsible use. Make sure to discuss the difference between fantasy and reality with your children. If exposed to gratuitous violence and sexuality, children and teens should know these are fantasy, and not the norm or real life. The dangers of violent and risky behavior should be a topic of conversation. For almost any age from 1- 99, limiting media to a few hours per day is reasonable and enforceable. Discuss education, values, and the intrusion of media regularly with your family. There is no definitive answer to whether mass media is “good” or “bad”. Research has shown that it can have both positive and negative effects, and often these effects are dependent on how the media is being used and consumed. The solution isn’t to totally cut yourself off from all mass media or to wholeheartedly embrace every facet of it. Rather, it must be carefully analyzed and evaluated. If you’re a parent, you need to help your children understand both the positives and negatives of things like video games, social media, and streaming television. Unless you plan on moving to an isolated island with no internet connection, this issue isn’t going away. The best approach is to tackle it head-on, rather than hoping things just work themselves out. Many people are choosing to engage with mass communication head-on with master’s degrees in mass communications. It’s with this progress we are able to understand the effects of mass media and other emerging social channels have on society currently and in the foreseeable future. Can your Smart phone serve as your PC? I saw this on “the Next Web Apps” RSS Feed and thought it was worth sharing. What if you could run around town with your Android phone using it like you normally do and when you get to the office all you have to do is dock it and start your day? That’s exactly what Ubuntu wants to do with its pitch to Android handset manufacturers to embed the operating system into its devices. 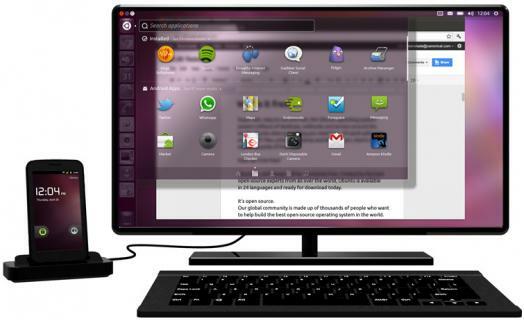 Ubuntu for Android is a full-featured operating system for desktop computing and all you would have to do is dock your phone to use it. While the operating system isn’t available right now, Ubuntu wants to get consumers excited about it so the pitch to handset creators will go that much smoother for it. Ubuntu states that a desktop environment hosted only on the web on devices such as netbooks haven’t gone over well with consumers since the desktop requires horsepower and storage for optimal productivity. The approach makes total sense and I could see Android handsets jumping on this bandwagon. One device that provides multiple functions, especially business functions, could become extremely attractive to IT professionals who are looking to control the costs within their organization. Instead of providing each employee with a desktop machine and a mobile device, all they’d have to do is provide them with a phone. Since employees would only be using one device, there would be less security concerns as well as issues with syncing things like calendars and contact information. As mobile phones get more computing power, the one device approach is becoming a reality and it’s one that I’d be interesting in giving a try. Even though Google does a great job at syncing information, I’d much rather only have to worry about having one device that could replace my laptop with nothing more than a few peripherals that I can leave behind when I’m on the road. There’s no time-frame for when we could see Android handsets with this capability but if the company can prove that consumers want something like this, it’s a no-brainer for handset manufacturers. I find it very interesting where Mobile Apps, Events, Services, Art and Transportation intersect. There is a great article and video on the Fast Company Micro Site called CO.EXIST about Helsinki “Urban flow: A City’s Information, Visualized in Real Time – Combining a map, tourist information, and data about the city’s services, a new system is making Helsinki truly transparent.” Here is the text content, make sure you check out the video. It’s about 5 minutes but worth it if you like this topic. “According to Adam Greenfield, most public information systems aren’t very useful. He reckons a lot of kiosks you see in stations, plazas, and on sidewalks are expensive white elephants: a nice idea in some official’s mind, but not something that real people want to actually delve into on a consistent basis. “Our research suggests that the overwhelming majority of these remain woefully underutilized, resulting in virtually no return on the significant investment involved in installing and maintaining them,” he says, referring to his New York urban systems design practice, Urbanscale. Greenfield’s firm has teamed up with another in Helsinki, called Nordkapp, to develop something better. The result is what they call Urbanflow, an information system that both tourists and local people might actually want to use. Urbanflow provides layers of data: a way-finder allowing people to map A to B and find out about local services, and a mass of “ambient” city data on air quality, traffic density, parking, cycling, and public transport. Urbanflow is two-way: Users glean information, but also feed it back, for example reporting on, say, faulty streetlights or vandalism. Sami Niemelä, Nordkapp’s creative director, says the system is not only designed to be useful, but also “playful,” encouraging people to use it. He also wants to change behavior, making people more aware of their environment.